Apologies for a long absence. There have been a lot of weddings, visitors, and travels recently, and I haven't been able to get myself in front of this blog for long enough to properly write up anything. 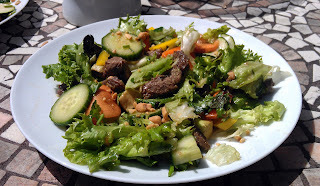 It's a shame, really, since this salad was so delightful, and perfect for the bit of sunny weather we had. A and I were probably going through one of our many phases of trying to eat slightly healthier, lighter meals, and this was a huge winner. I'm pretty sure I used a cut of beef that was not particularly luxurious, but made sure to only sear it quickly so that it wouldn't get tough. I see a mix of lettuce, rocket, cucumbers, and peppers on the plate, so let's assume that is what I used, though really any leafy, crunchy, crispy vegetables would work as well. I think the crushed peanuts on top were the real kicker to this recipe, so try not to omit them if at all possible. 1. Mix beef slices with marinade ingredients, and set aside for at least 10 minutes but overnight if you wish. 2. Assemble your salad with all salad ingredients except for the beef and peanuts. 3. Put dressing ingredients in a jar or container and shake well. 4. When beef is done marinating, heat a pan over high heat. Toss beef in and quickly sear it on all sides before removing to a plate. 5. Pour dressing over salad leaves and toss well. Plate the salad on serving plates, then top with beef and a scattering of peanuts.